Our in-home day training program provides the fastest most convenient path available to a polite well-trained dog. We come to your home and train your dog for you, even while you’re at work (we’re licensed, insured, and have references). Our trainers’ expertise allows to us teach your dog in 3 weeks what more traditional obedience classes cover in 3 months. 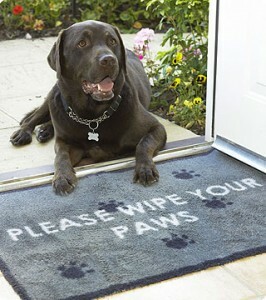 Reliably responds to commands like sit, down, stay, come, and leave-it. In-home day training can also be ideal for addressing serious dog behavior problems like aggression, separation anxiety, and shyness. We Get to Know You: We’ll come to your home to evaluate your dog’s behavior, determine your priorities, and design a custom in-home day training plan to meet your needs. Written Agreement: We’ll write up a training plan the describes exactly what to expect of the process and your dog’s behavior so that we all know what your dog will learn. We Train Your Dog: We’ll come to your home just to work with your dog 3 days each week. You’re welcome to watch if you’re home, but we don’t involve you much. Most of our clients are at work during these sessions. We Train You: At the end of each week, we’ll do a lesson just for you and your family. We’ll train you to maintain and build upon what we taught your dog that week. In-home day training works so quickly because both you and your dog get to learn with a partner who knows what she’s doing. Our owners, Mel and Jeff, decided to start offering day training after – of all things – taking a dance class. We found that when we tried to learn new steps, we often tripped over each other and could seldom figure out what went wrong. The instructors, however, could take either one of us and teach us to do the step perfectly in just a few seconds. Because the steps were second nature to the instructors and because they had taught hundreds of people to dance, they could stop our mistakes before we made them and make it all seem easy. Dog training, like dancing, is a mechanical skill. When a novice owner and an untrained dog work together, they tend to confuse each other. In day training, your dog gets to learn from an expert trainer, who – like our dance instructors – can guide him past any mistake so that he learns very quickly. When it’s your turn to learn the exercises, you get the benefit of working with a dog who already knows what to do. It makes learning faster, easier, and more fun for both of you. Call today to schedule a preliminary consult. You’ll be amazed by how quickly we can transform your dog’s behavior – all while you’re at work.